Thirty-two years ago, Robert Swan made history as the first person to walk to both poles. Even as a young man, these grueling expeditions took a harsh toll on his body. Passing directly beneath the hole in the ozone layer, Swan’s face became badly burned and his eyes even changed color. But the Arctic explorer now says that all of that physical duress pales in comparison to the agony of watching his son go through the same experience 32 years later. 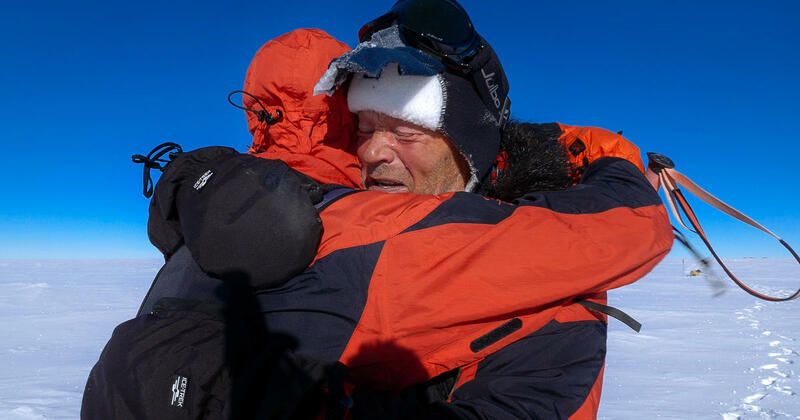 This past winter, after years of preparation, Robert Swan set out to trek the 600 miles to the South Pole again — this time, with his 24-year-old son Barney by his side. And this time, with an additional challenge built in: they would survive exclusively off of renewable energy. It was a “swan song” with a very important goal. If the father-son team could get by on renewable energy in the harshest environment on Earth, then people in the comfort of their own homes could do it, too. This winter, Barney and Robert Swan became the first explorers to ever trek to the South Pole surviving exclusively off of renewable energy. The success of the expedition necessitated the pioneering of new equipment that would use renewable energy to melt snow and ice into hot water on the move in the Antarctic. So, while Robert had previously used jet fuel to cook his food and keep warm in the -40-degree temperatures, this time he and his son used biofuels derived from wood chips to do the job. They used solar panels, provided by NASA, that plugged into their sleds to melt ice and snow into drinkable water. Robert and Barney Swan towing sleds topped with solar panels across Antarctica. “We’re attempting to do something that no other expedition has tried yet in the hope to really show that these technologies can work, not only in our own nations, in our own homes, but in the world’s most hostile place,” Barney explains in the CBSN Originals documentary, “Expedition Antarctica,” as he and his father are preparing to set off on their unprecedented journey. While the energy sources sustaining them were different, Antarctica’s climate was as unforgiving as ever. And once again, the combination of subzero temperatures and strenuous physical activity began taking a harsh toll on Robert’s body. Robert Swan peers out of his tent at the brutal negative 40-degree conditions outside. Robert finally realized that in order for the expedition to succeed he would have to bow out. The team had to keep up its pace or risk running out of food and fuel; slowing down or waiting until he recovered weren’t options. So he made arrangements for a helicopter to transport him back to base camp, and he made the excruciating decision to leave Barney behind to finish what they’d started. Barney, however, didn’t see his father’s decision as a failure. On the contrary, the 24-year-old, whose toe was turning black due to the brutal negative-40-degree temperatures and repeated banging on his boots, was overcome with pride for his dad. Barney, more determined than ever, continued on toward the south geographic pole. And when he was 60 miles from the goal, Robert choppered back in to join him, so that together, they could complete their mission. Now, father and son have both inked their names in the history books. They’ve risked their lives to send a dramatic message to the rest of the world about the feasibility of climate solutions. And they’ve proven that a passion for adventure, innovation and discovery just may be something that’s passed along, from generation to generation. Listen to Robert & Barney Swan detail their journey across Antarctica in the Global Goalscast.